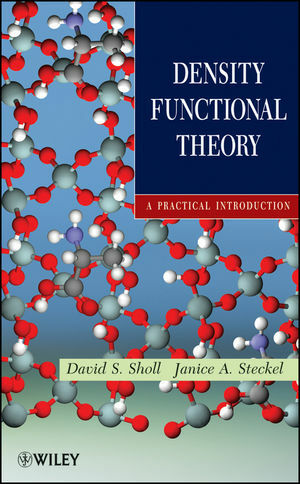 Density functional theory (DFT) is one of the most frequently used computational tools for studying and predicting the properties of isolated molecules, bulk solids, and material interfaces, including surfaces. Although the theoretical underpinnings of DFT are quite complicated, this book demonstrates that the basic concepts underlying the calculations are simple enough to be understood by anyone with a background in chemistry, physics, engineering, or mathematics. The authors show how the widespread availability of powerful DFT codes makes it possible for students and researchers to apply this important computational technique to a broad range of fundamental and applied problems. This text is written at a level suitable for individuals from a variety of scientific, mathematical, and engineering backgrounds. No previous experience working with DFT calculations is needed. David S. Sholl is a Professor of Chemical & Biomolecular Engineering at the Georgia Institute of Technology, where he holds the Michael Tennenbaum Family Chair and is a GRA Eminent Scholar in Energy Sustainability. Janice A. Steckel is a Physical Scientist at the U.S. Department of Energy, National Energy Technology Laboratory in Pittsburgh, Pennsylvania.